DID Venkataraman who attained Self knowledge at Madurai itself need any further initiation or penance, ask some. The saint-composer Thyagaraja also questioned, "Did one who knew that he was not the body need any japa?" For such a one who had no desires, any penance cannot be for any selfish reason. So, it is implied that the penance of such a one can have some other meaning. "One with the knowledge of Brahman must be Brahman itself." Yet in this illusory world his physical body was very much visible, it was performing some functions. Hence for a liberated being there might be no karma [?] but his body did not escape the efforts of karma [?]. All liberated beings may not be involved in family affairs. Some like Janaka ruled the land, yet some others like Dattatreya acted as teachers to seekers. Those appointed to be teachers needed certain credentials, they had to have practice, knowledge and oratorical skill. Without these, their position would not have the imprimatur of the cosmic force. Did not Sri Ramakrishna say, "People will accept the orders proclaimed through public announcements only if they are made by one authorized by government to do so." stages of preparation in the lives of every prophet. After acquisition of Self knowledge Jesus spent forty days in seclusion. Everyone is familiar with the experience of the Buddha. Mohammed became a recluse in mountain caves. Such being the case, why doubt the need for a period of preparation to those divine beings in human form who were to become World Teachers? The moment Sakti entered Venkataraman it was decreed that the body was meant for the world. Hence it had to be prepared for the prescribed duty in seclusion. Likewise, it had to sever all family ties which were opposing forces and also move to a distant place ? Arunachala. For every atom of the body to be filled with Sakti and be ready for the benefit of humanity, time was needed. It was due to the inspiration of that Sakti that Swami's body abided in the atma and did not even look at the world or people; speech also got internalized. Nobody, except those great ones with divine eyes, can ever know what chakras were pierced, what occult powers accumulated in that body during that period. Hence, no one can describe these events when they were actually going on. By the time it came to the practical world, the body was not the same. It was the body of Parameswara, every atom of it was sacred, powerful. 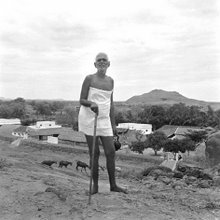 Having said that Arunachala was the guru of preparation let us now turn towards mundane activities. It was at the mango grove of Venkatarama Naicker near Gurumurtam that the Swami's activities in the form of teachings commenced. During the period of intense preparation the Swami's power of speech receded, and when he resumed speaking it was difficult. All that the Swami could do was to utter a few words to Palaniswami, his attendant. Uddandi Nayanar came to know that the Swami had knowledge of Tamil. Thereupon he begged him to give him some upadesa. By then the Swami was not familiar with any scriptural literature, whereas Uddandi Nayanar had already read a lot of it  what he looked forward to was some teaching born out of experience. As if to suit him, the Swami wrote the instructions on scraps of paper. Nayanar retained them until his last days, as precious treasures. He recited them with the reverence reserved for the mahavakyas. This was how Uddandi Nayanar became the Swami's first disciple. The instructions of the Swami were lost. Possibly they were specific to that person. But this would scarcely be sufficient for a World Teacher. Sakti would certainly provide him an opportunity to acquire knowledge of the sastras. Tambiran would constantly be singing Thevarams or Tiruppugazh, which were a treasure house of spiritual thoughts  by listening to him the Swami had by then become familiar with them. go through the texts in a short time and explain them in easy language to Palaniswami. The Swami was intelligent, he had the experience of Reality and was capable of memorizing the terminology. Thus because of Palaniswami the Swami became familiar with the Tamil texts of Kaivalya Navaneetham, Vasishtam, Viveka Choodamani and the like. Palaniswami became the second disciple of the Swami. The Swami never initiated anyone. But it was said that by his look or appearance in their dreams and touching them on the head or heart he had granted initiation to some. His upadesa consisted mostly in the replies he gave to the questions of seekers. Each one would come to know by his experience whether the Swami accepted him as a disciple. For them there was never any doubt. But there was never any practice of formally accepting anyone as a disciple or initiating with a mantra or some such thing. knowledge to the Swami, it remained for him to assume his role. But to become a World Teacher a seat was necessary and we shall now see how it was provided.